In the summer of 2010, my former high school player, Daniel Nava, was called up by the Boston Red Sox. In his first Major League at-bat against the Phillies Joe Blanton, he hit a grand slam home run on the first pitch. I was frantically driving home to see the game on FOX when I heard the play-by-play on the radio. I almost drove off the road. It was a tremendous thrill for the Nava family, for me, and for all his former coaches. 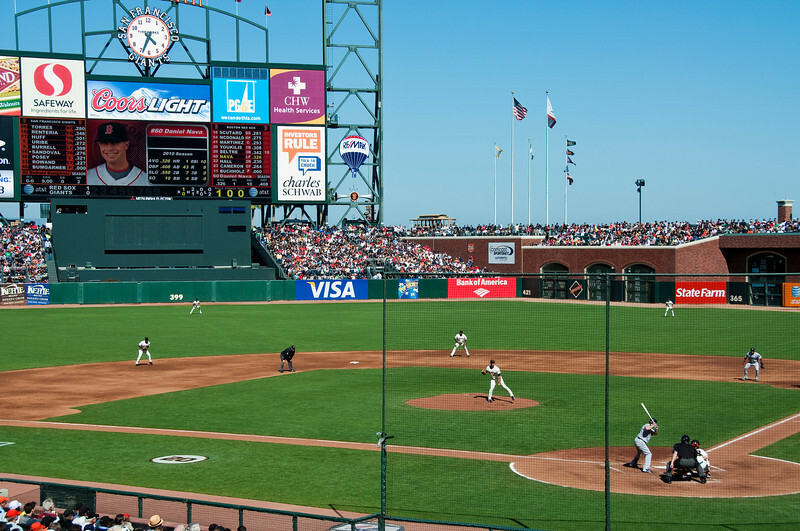 In the ensuing weeks and months, I had the chance to get on the field at Pac Bell Park in San Francisco, see the three game series, and then travel to Boston for my first visit to Fenway Park on Labor Day Weekend. These photographs are from the two series in SF and Boston. Daniel spent 2011 in AAA at Pawtucket, but 2012 rolled around and the Red Sox once again found themselves in need of an outfielder, so Daniel was once again summoned to Boston. My wife and I were able to catch a game at Fenway and spend some time with him.